On our Maremma tour, we do not go to the chic resort area of the Antinori and Alain Ducasse set- which, in my opinion, has little to do with the real Maremma, plus the flat countryside is uninspiring for the walker. 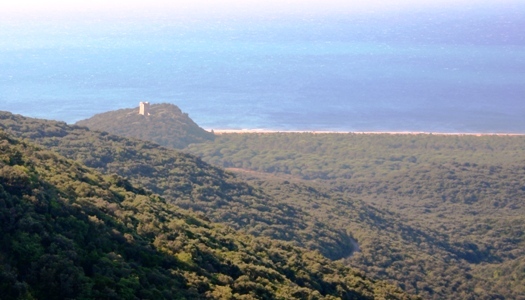 I prefer the hilly coastal area of the Maremma regional park (also known as Parco dell’Uccellina) with its stunning pristine coast, and the wonderfully mysterious Etruscan sites further inland. Everyone on our walking tour in the Maremma was amazed at the Etruscan city of Vulci, which was later occupied by the Romans, and contains the remains of a perfectly preserved stretch of Roman road and spooky frescoed tombs. This is a place rarely mentioned in travel magazines yet was a highlight of our tour. It is just over the Tuscan border, in the region of Lazio. The walk along the Etruscan byways carved into the rock near the hill town of Pitigliano was lots of fun, along with sampling the sweets from a Kosher bakery in the old Jewish quarter. The coastal walks in the Parco dell’Uccellina rank among my favorite walks in Tuscany, perhaps because I first visited the park back in 1988 a few months after I had moved to Italy, when everything was a new adventure. I took a dawn train from Florence, then deciphered the bus schedule in order to get to the park, did a long hike and then sprinted for the bus to connect to the last train back to Florence. You don’t have to worry about any of that on our walking tour! Instead you’ll wander through pink heather and wild rosemary (okay, you’ll pant for a while uphill) and end up at Tuscany’s loveliest beach, where you can cool your feet in the turquoise sea. In 1993 the Parco dell’Uccellina received a European diploma for being among the most well-protected areas in Europe, and it can only be visited on foot. Within the park there are several watchtowers dating from the 11th to the 16th century, an enormous variety of Mediterranean plants, as well as cultivated olive groves and a few areas of pasture favored by the local maremmana cow, an impressive beast with alarming horns. The maremmana cow is often only encountered in restaurants, in the form of bistecca – a thick T-bone steak served rare. I had a fabulous bistecca grilled over an open fire at the Trattoria Verdiana near Montemerano. 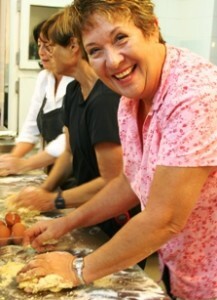 The next day we had a cooking lesson in the kitchen with the simpaticissima cook, where we learned to shape homemade pasta and make zuppa di pane – a bread soup with greens we picked from her garden. 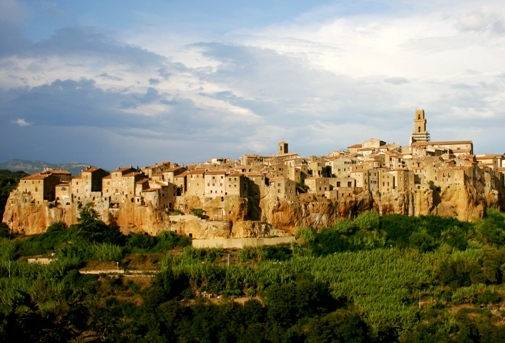 Aside from the Saturnia spa, with it’s sulfur hot springs (and accompanying odor) the country towns of la Maremma are relatively free of tourists, yet full of intriguing sites and fascinating walks. 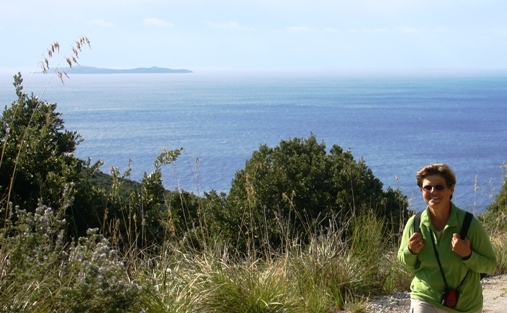 Join us for an off-the beaten path walking tour in southern Tuscany’s Maremma, and experience idyllic coastal walking and lots more. This post brought back wonderful memories of a great trip. Would love to see you sister again if she ever makes it to San Diego. Will make sure Rosemary knows she’s on the site. Thanks Diane, it is always a pleasure to travel with you and the rest of the “gang”, and please do let Rosemary know I posted a photo of her. Pauline is headed to Italy this week on a private tour with her granddaughter-I’ll let her know that you’ve been in touch. I just came back from Umbria and part of the Maremma and it was as lovely as ever. This was a flood of memories from a wonderful trip. Can’t wait to be back in Italy this week with my granddaughter. Hi Diane! You guys sure were a great group to travel with. We’re going to try and plan an ” Emanuele dinner” with recipes from your entries. We’d love to have Pauline join us if she can get away. Sounds great Diane- I’ll be posting a few more recipes this week. Let me know how it turns out! What a fun post! I got a giggle out of the fate of the Maremma cow. 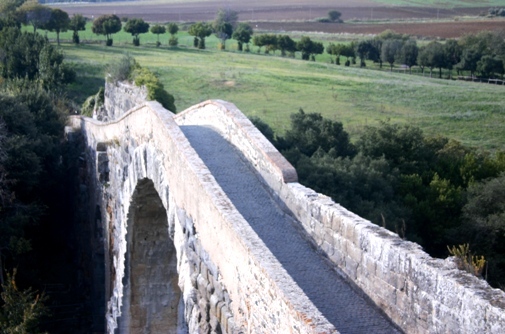 I’ve never been to Vulci and didn’t realize it also had a bridge called “Devils bridge” – isn’t there a place by that name also in Tuscany? I am exploring the Maremma a lot as we recently got a “beach home” inland, and I also work for Tuscany’s social media team which is just an excuse to blog about art in Tuscany 😉 ! I recently made a Maremma itinerary (here: http://www.turismo.intoscana.it/allthingstuscany/tuscanyarts/weekend-in-maremma-tuscany-itinerary/), and I bet you could add something to this – if you do, please comment! I’m impressed by how much you walk, I don’t think i’d have the energy to do much of this. It’s too bad as it’s a great area for trails. By the way I also think the sign “a tratti sconesso” is HILARIOUS! I’m going to follow this blog via rss now. Thanks Alexandra, it’s always great to hear from someone who loves the Maremma. I clicked on your link but got an erro message-then I looked at your site and my anti-virus program sent me warning messages about a virus in your site so I ran away quickly! 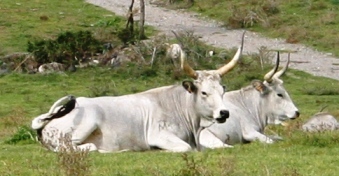 Anyway, Vulci is worth a visit (just over the border of Tuscany in Lazio) and the maremmana cow worth eating!